In another in a series exploring the use of expedited FDA approval options, Leela Barham looks to see if there is a boost to the speed of FDA approval when a drug not only secures one or more of the FDA’s expedited development and review methods, but when they are also designated an orphan drug. There is an overlap between novel drugs approved using one or more FDA expedited development and review method and orphan drug designation. Taking the average over 2015 to 2017, 44 per cent of novel drug approvals using one or more expedited approval option were also an orphan. Whilst orphan drug designation does not set out expectations for the timing of drug approval, some in industry anecdotally suggest that it’s the orphan stamp that feels like it speeds things up when using expedited options at FDA. But is that the case? 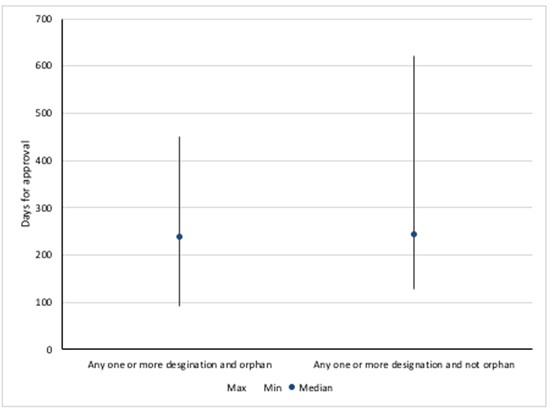 Taking a three-year perspective suggests that there is little difference in the median approval times when orphan designation is also in place when using one or more expedited option (Figure 1). There does appear to be greater variation in the speed of approval though, with the range including longer approval times for non-orphans. 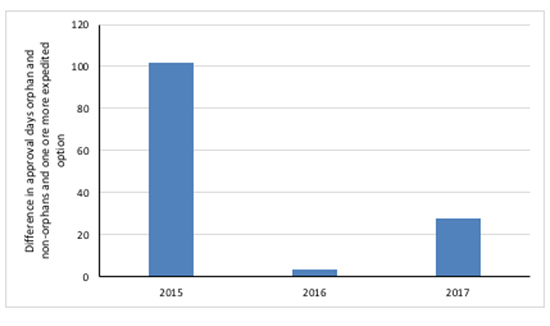 Source: Analysis of FDA novel drug approvals data 2015, 2016 and 2017. Note excludes an extreme outlier in 2015. Another way to dig a little more deeply into the question of whether there is an orphan drug boost to speed of approval is to compare the speed of approval for FDA expedited development and review options used in combination (another is looking at each of the options by themselves, but there’s not a clear reason why orphan status should boost one or another expedited option). Pooling the three years of data reveals that it’s a mixed bag; sometimes the orphan was approved faster, but sometimes not. Another way to cut the data is to look at trends over the three years. 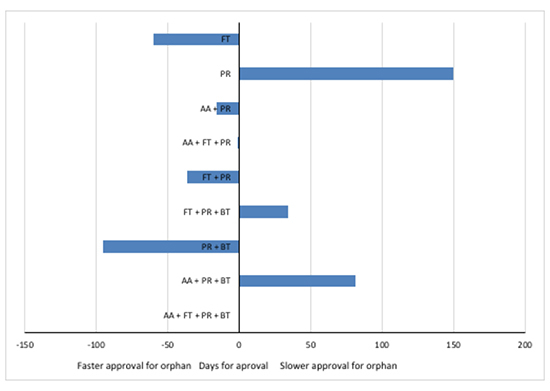 That does suggest – although it’s not been statistically tested – that there have been differences in the median speed of approval for orphans versus non-orphans when one or more expedited approval options were used in the past (Figure 3). However, the difference in the median speed in orphans and non-orphans for each year from 2015 to 2017 has been falling (Figure 4). So even if there was a difference, it might not have persisted to now. Should orphan drugs be approved faster? Orphan drug status is not linked to achieving faster FDA approval as a matter of current policy, and it doesn’t seem it is in practice in recent years either. The FDA already has a job in trying to the back-log of applications for orphan drug designation. Next could be also speeding up approval, something that is already being .